Beautiful, on-ear, active noise-canceling headphones. They cost the same ($350) as the popular Bose QuietComfort 3 headphones. Note: The product's original release date was planned for late March, but AKG has pushed the launch until April 30. Frequent flyers, subway riders, and other people who take loud mass transit, abuse their gear, and unceremoniously stuff it in a bag. Compact, lightweight, and as close to indestructible as a pair of 8.3-ounce headphones are going to get. They fold flat and they collapse along a sturdy metal hinge above the ear cups, so they'll contort to fit into your carry-on's cramped pockets. You turn the noise-canceling on and off by rotating a ring on the left ear cup. The noise canceling stylins are powered an internal battery—charge 'em with either the included USB cable or wall plug. Unlike the Bose cans, these headphones will work when the batteries are dead. A toss-up between the compact, tough design and the immersive, textured sound. They could sit a little more snugly on the ears. The beefy leather ear pads give the headphones a great seal, so sound quality doesn't suffer, but they tend to slide around on your head. The headphones fold every which way, so they're easy to cram into a backpack, but they don't collapse into a symmetrical package like other cans. Disconcerting when you actually try to pack them up "properly" and find yourself holding a brainteaser. • Testing took place in NYC, where we used them daily for about a month. Lots and lots of rock music, with occasional hip hop, electronic, and experimental tracks worked in. Used high-quality AAC files and Spotify streams. • Subtlety and nuance of recordings is on par with studio headphones. Dizzying sense of depth. Get ready to feel some awesome queasiness on recordings with lots of drastic left-to-right pans—specifically, the guitar solos on T. Rex's Electric Warrior. • Not much boom on the bottom-end as others, but the bass isn't thin either. For example, the headphones deftly handle the super-low organ bass line on "Auntie's Lock/Infinitum" by Flying Lotus. • Bass improves noticeably with the noise canceling turned on. 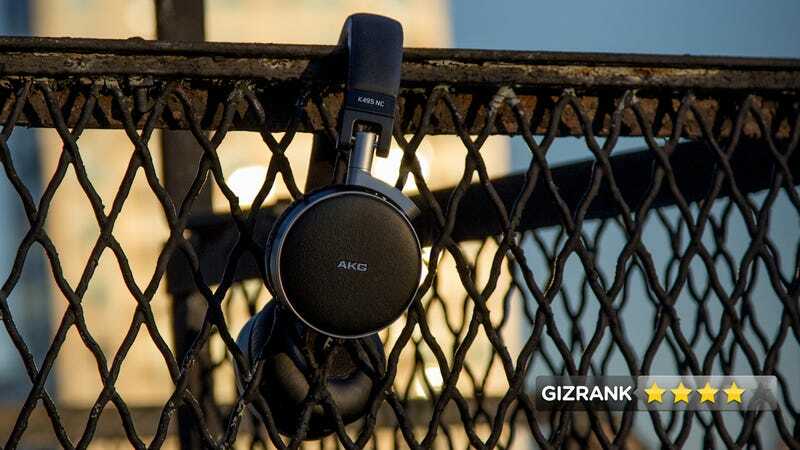 • AKG's noise-canceling algorithms do a great job of blocking out the racket of subway noise, and doesn't distort the music or create noticeable atmospheric anomalies like hiss. • Leather ear pads break in after about a week, making these some of the most comfortable on-ear headphones, period. Initially, the stitching on the inside of the ear cups was irritating, but over time, the threads softened to the point that it's unnoticeable. • While slightly heavier than some of their competitors, the sturdier, flexible build of more than made up for the difference. Yes, especially if you're on the move a lot. These aren't the only great-sounding, noise-canceling headphones out there, but none are better built for your backpack or suitcase.